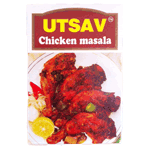 A hot and spicy masala mix for your favourite meat including chicken. A spice is a dried seed, fruit, root, bark or vegetative substance used in nutritionally insignificant quantities as a food additive for the purpose of flavoring. Broadly, there are two main subdivisions of spices one being the major spices and the other is minor spices. For example the spices like pepper, cardamom, ginger, turmeric, chilies etc., comes under major category. The important minor spices grown in India are ajowan, aniseed, caraway, celery, coriander, cumin, dill seed, fennel, fenugreek, garlic, onion, saffron, vanilla etc. Product of India. While every care has been taken to ensure product information is correct, food products are constantly being reformulated and nutrition content may change. We would therefore recommend that you do not rely solely on this information and always check products labels. Where further dietary information is important to you, for example because you have an allergy or specific dietary requirement, you should contact the product manufacturer or our helpline. Although this information is regularly updated, we are unable to accept liability for any incorrect information. This does not affect your statutory rights.